I have written several articles recently describing Spain’s continuing Great Depression levels of unemployment and the absurdity of the troika’s policies with regard to the “threat” presented by “deflation.” The troika consists of the European Commission, the European Central Bank (ECB), and the International Monetary Fund (IMF). This column focuses primarily on Italy’s related economic and political problems, but it also briefly discusses what is likely to be political instability in the longer term in France and Spain as well. Update: it appears that Italy’s prime minister’s resignation could be imminent (see discussion below). 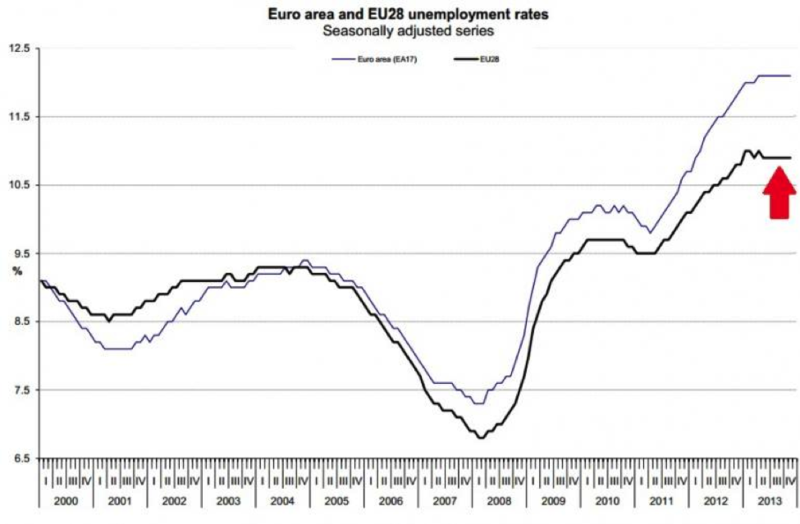 Italy and Spain are suffering Great Depression levels of unemployment. Collectively, there population is roughly 105 million, which is nearly one-third of the eurozone’s total population of roughly 330 million. Italy and Spain are two of the eurozone’s largest economies data are as of yearend 2012 and are taken from the “Trading Economics” site.) Note that Italy and Spain’s GDPs are still materially smaller than they were before the crisis. They have not begun to dig out of the hole they have been in since 2008. The fact that the troika does not find it an unacceptable emergency that one-third of the eurozone’s population has been forced by the troika’s self-destructive “austerity” policies and the severe defects of the euro into a gratuitous Great Depression proves that the troika consists of three organizations that are abject economic, anti-democratic, and moral failures. (In fairness, the ECB and the IMF were designed to be anti-democratic and they have succeeded in that portion of their mission. The theory was that their anti-democratic nature would be an advantage. That theory has failed, but the ECB and the IMF remain proudly anti-democratic failures.) The troika’s anti-democratic for a rational reason – they stink at their jobs and would have been tossed out by a democratic electorate years ago. The most recent Gallup poll results produced this headline: “EU leadership approval ratings tumble to all-time low.” The poll found that: “citizens who approve the EU’s leadership are in a minority in as many as 23 countries out of the 27 surveyed.” The more EU citizens dealt with the troika the less likely they were to approve of the EU’s leadership. The article ended with the point we have been emphasizing. The euro and the troika are the gravest threats to European unity. “An earlier survey by Gallup showed that up to 60% of citizens across Europe said there were ‘better alternatives to the policy of austerity’ and 51% said the austerity-driven response of the EU since the economic crisis ‘was not working’. These sentiments also reflected on the EU leadership approval ratings released this week: ‘Disapproval is clearest in the bailout countries where the EU has imposed austerity policies, compounding the economic hardships individuals were already experiencing from the financial and economic crisis,’ Gallup said. The figures on the rejection of the troika’s central lie – “there is no alternative” (TINA) to quasi-austerity – are exceptional. The troika, the individual Eurozone governments, and the media have spread the TINA propaganda with a zeal that is hard to imagine unless you are a fellow geek who has to spend an inordinate portion of his or her life reading the endless propaganda. It is a testament to the reality-based community that they have rejected this failed economic dogma. It is important to be precise about the troika’s austerity policies – they are actually hybrid policies involving modest fiscal stimulus. Almost all the Eurozone nations run government budget deficits. The ECB’s most recent Monthly Bulletin reports that in 2012 the eurozone’s overall average governmental budget deficit was 3.7% of GDP. Remember that the bogey man of running deficits in response to a recession is supposed to be hyper-inflation – and that “Euro-area inflation remained below half of the European Central Bank’s target in January .” These facts demonstrate that fiscal stimulus is criminally inadequate and unnecessarily consigning many millions of Europeans to unemployment and migration. Instead, all the Eurozone hysteria is about “deflation” – but the troika refuses to recognize that the problem is grossly inadequate demand (hence Great Depression levels of unemployment and virtually no inflation). My prior columns have explained the troika’s and business media’s insanity of acting like it makes sense to wait until an economy in a Great Depression is also on the cusp of deflation before acting and insane to think that monetary policy (instead of fiscal policy) is the effective means of responding to deflation. “European Central Bank President Mario Draghi said at the weekend that the ECB wanted to ensure that inflation in the euro zone did not drift into what he called a ‘danger zone’ below one percent”. The obvious problems with Draghi’s “danger zone” claims are that the eurozone’s mean inflation rate (0.7%) is well within the danger zone, some nations in the periphery already have deflation, and Spain and Italy have falling inflation rates below the already inadequate eurozone average. Recall that the ECB’s inflation target is 1.5 percent – which means that under its own (failed) theories its policies are failing to produce the outcomes the ECB wishes to achieve. Draghi’s response was to redefine “danger zone” as not dangerous, and no longer a “zone” of one percent or lower inflation. Draghi redefined his own definition of a deflationary “danger zone” into the completely benign phrase – “a prolonged period of low inflation.” His specialty is propaganda, not economics. Had the troika actually tried to mandate “balanced budgets” they would have succeeded in putting even many core Eurozone nations into a Great Depression. The modest fiscal stimulus does provide the prospect of a very weak recovery. Rehn’s nightmare vision that it will take Spain, Italy, and Greece an additional decade (yearend 2024) simply to crawl out of the “crisis” phase of their Great Depressions. Their recessions began in 2007 and 2008 so Rehn is predicting Great Depressions that will last far longer than that of the 1930s. Rehn makes no promises as to how long beyond 2024 it will take for the periphery to attain full employment. As I have emphasized in prior articles, Rehn’s nightmare is actually the troika’s optimistic scenario because it assumes that there will be no negative economic shocks from 2014 to 2024. The troika does not suggest that Rehn’s nightmare scenario is realistic. It is already warning about a number of potential shocks. The troika consigned the residents of Spain and Italy to twist slowly in the wind. The chilling promise of its principal propagandist, Ollie Rehn, made in response to the recent news that the unemployment rate rose in Spain, is that the troika expects that the eurozone’s periphery will continue to twist slowly in the wind for another decade. “Italy’s jobless rate rose in November to a new record high of 12.7 percent. Prime Minister Enrico Letta has called the youth unemployment rate a national emergency. “While economists predict unemployment in December stayed at an all-time high of 12.1 percent, with about 19 million jobless, that tally excludes legions of adults who would also work if they could. Bloomberg calculations for the third quarter show a wider total of 31.2 million people of all ages are either looking for jobs, willing to do so though unavailable, or else have given up. Giuseppe Di Gilio, 30, is one of 4.2 million such people who don’t appear in Italy’s unemployment statistics. The most recent so-called labor underutilization rate in the third-biggest economy in the euro area was 24 percent, more than double the official jobless rate. The euro area’s official unemployment rate includes only those who actively sought work in the previous four weeks and are available to start within the next two weeks. The labor underutilization rate compiled by Bloomberg using Eurostat data for the third quarter includes the official unemployed as well as those willing to work who have given up looking for a job or are not immediately available. The troika has been eagerly trying to induce large wage cuts for workers in the periphery. This further reduces already inadequate economic demand and harms the recovery as well as the workers and their families. The same Bloomberg article explains that the wages for many Italians are so low that they discourage employment. “Over 12 percent of workers in Italy aren’t able to live on their salaries alone, according to an EU study published this month. That’s the highest percentage after Romania and Greece. Italy is also one of the worst countries in which to lose a job, since the percentage of people able to find other employment within a year is between 14 percent and 15 percent, the lowest in Europe. The Bloomberg article shows that Italy is behind most of Europe in female employment. “‘It pays off for women to stay at home,’ also because of the lack of child-care services, Bank of America’s Tenconi said. Italy’s female employment rate in 2012 was 47.1 percent, the lowest in the EU after Greece, Malta and Croatia, and below the region’s 58.5 percent average. Youth unemployment in Italy has been a national emergency for over five years – Letta is right, but far too late. 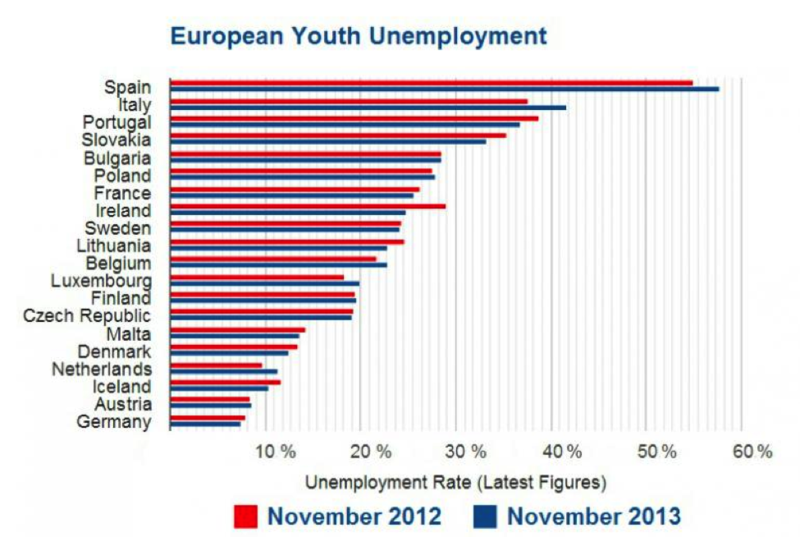 Youth unemployment is horrific in the eurozone periphery. Note that youth unemployment is significantly worse in the eurozone than in the broader category of Western European nations. The eurozone members were supposed to be the stronger, more sophisticated economies with the superior institutions such as the ECB, but for the reasons we have often explained, the euro’s tragic design flaws and the troika’s economically illiterate “bleed the patient” treatment of insufficient demand has made the eurozone a deeply inferior series of economic institutions and its treatment of the periphery a disgrace. The same article from which I took the charts explained some of the special problems caused by youth unemployment. “Youth unemployment, defined as jobless working-age people under the age of 25, is of particular concern because it can take much longer for younger inexperienced workers to re-enter the workforce and they end up with fewer economically active years in which to pay income taxes to support social services. There is also a correlation between high rates of unemployment among youths and social unrest. Italy’s Great Depression is doing great damage to Italians, but it has also prompted political instability and the troika’s assault on Italian democracy when they staged a de facto coup to install former Prime Minister Mario Monti. Of course, given that they were deposing Silvio Berlusconi, there were few protests. The troika acted even more anti-democratically in forcing the abandonment of the plebiscite in Greece. The current Italian political drama involves the question of how long Prime Minister Enrico Letta can remain in power. Matteo Renzi is trying to replace him, without benefit of an election. Renzi’s quest for power is greatly aided by Italy’s Great Depression. Update: Renzi has just called for a change of government. He is indicating that he wants to rule without any vote by Italians. Renzi is popular, but taking power without a vote is not. By discrediting national institutions such as his party by caving in to the troika’s and the French business sector’s demands for greater austerity Hollande has inadvertently created great discord against the eurozone. The same neo-liberal critic explains. “The far-right National Front led by Marine Le Pen, which campaigns on a tough anti- immigration platform and would take France out of the eurozone, is the main beneficiary of this sense of popular disenfranchisement. Hollande is even more unpopular than the (conservative) Prime Minister Mariano Rajoy of Spain. Again, that is a significant accomplishment because Rajoy’s austerity helped push Spain to the highest unemployment rates in its history. As we stress repeatedly to try to get the fact to penetrate to the media, Spain is in a Great Depression. Hollande is now pushing increased austerity in the form of significant cuts to public spending. That makes him the very model of the modern social democrat. They become pale imitations of the conservative party who do the dirty work for them of crippling the most effective social programs, discredits the (once) progressive party, and loses control over the parliament or legislature. This entry was posted in William K. Black and tagged depression, France, Italy, mario draghi, Ollie Rehn, spain, troika. Bookmark the permalink. The voters’ rationality and competence? Really? I challenge you to find a single European who wants to drop the Euro. You can even ask them in Greece. They’re as incompetent as their leaders and that’s why they get the leaders they get. All too true, but I can’t blame the public as they don’t hear anything but the company line from the mainstream media. It’s the same thing in Canada, where a do-nothing federal budget is being praised for putting us on a prudential road to balance. Madness with the economy stagnating, but the talking heads don’t know there is a better explanation out there, unfortunately, so they go with sound finance because it sounds like common sense. What’s it going to take to persuade people that a currency-issuing government is different from a business or household? Just a thought .. ? During the last century’s World Wars, in many nations real resources were rationed, money was not. Money is not a real resource, it is infinitely available at the discretion of the monopoly issuer. This, is an unassailable fact. Why not broadcast this reality ? The ONLY source for money is the monopoly issuer, counterfeiting is illegal? The government by choosing to ration a man made item, (money) which can be produced in infinite amounts, is a crime. Exactly, in times of war, money is no object. We don’t wait years to accumulate a stock of money before we can buy our weapons. The government just makes it happen. Why does this same urgency not apply to the myriad wants and ills plaguing society today? We should be striving to ensure chock-full employment and eradicating poverty but don’t because the public gets hoodwinked into believing the cupboard is always bare. It’s frustrating to see us perpetually operating below potential when we could do so much better. But that’s socialism and we can’t have that. Greeks (and I suspect most periphery countries) ‘not wanting to leave the euro’ is NOT a vote for the euro. The Greek majority want to avoid at all cost disorderly grexit / economic isolation PLUS perpetual debt. So, the idea is to STAY in the EZ until whatever (orderly) denouement – to reap whatever benefits might accrue from that. grexit. In fact this option was actually off the table & not allowed to happen – despite the propaganda – because Greek ‘loans’ were needed to pass through BoG and back into german & french banks. Not only the loans, but greek savings, taxes etc (for the interest payments). The cushion is long gone & GR is too far down the road of austerity to survive a grexit now….this is the thinking among the public. The bets are on EU destabilisation, meltdown. Here I am. And surely I’m not alone. Well said regarding the European citizenry. I suppose you could describe the citizens of the U.S. in a similar manner. Their incompetence, lack of understanding of even basic economics and politics certainly exceeds that of the average citizens of the Euro Nations? Take a look at what passes for leaders or statesmen in this miserable nation. Do they make you confident they have a grasp or understanding of critical issues? Do you feel secure that they possess the ability to think critically and develop solutions to the potentially catastrophic problems we are faced with at home an globally? I doubt an affirmative answer is possible? Mike, aren’t there many Italians who want to get out? At least enough of them to give Warren pretty good audiences when he goes over and runs through scenarios assuming that they withdraw. 1. The incompetence of the leaders is disputed. Is this a matter of incompetence, or “evil”? 2. The share of the vote that is informed is usually not that large. The public cannot be expected to understand fully what they’re voting for or what their options are. Not even political analysts get it right, so how could your average Joe? 4. No one “deserves” the leaders they get. Go tell that to someone from the UK, when discussing M. Thatcher and her legacy ;). 5. I’m a European and as i explain in another comment – I am prepared to drop the Euro and at the very least reform it. There are quite a few of us too, if you just ask the right questions. Unemployment in Greece broke all previous records! General unemployment climbed up to 28% in November 2013, while unemployment has hit the youth with 61.4%. A total of 1,382,062 people are without work and income, according to Greek Statistics Authority. Macedonia-Thrace 29.7% followed by Attica with 28.9% and Epirus-West Mecedonia with 28.8%, Crete with 27.5%. Registered as “unemployed” at the Labor Agency (OAED) are 1,069,341people. Only 170,015 jobless receive ‘unemployment allowance’. The allowance of 360 euro is been paid for 12 months independently from the number of working years. The statistics refer only to employees and not self-employed. PS and they happily lived ever after in Greece of success story and primary surplus. I add : I have not been able to find statistics in the self-employed / professional sector. However even in my chic upper middle class neighbourhood in central Athens, 50-60% of the shops & small business have closed down. Whole sectors such as construction are more or less nonfunctional, and most people formerly employed in this sector – from engineers & architects to construction workers – have had no work since 2009 / 2010. Meanwhile those self-employed that still have work – taxi drivers for example – have cut their fares, yet still do not make enough money to pay their social security contribution (pension & medical) of 500€ per month. They are doing well if they clear 500€ profit before taxes and after paying petrol, insurance, road tax etc. Thus most unemployed are currently without medical insurance & behind in their pension contributions. I don’t know how international media reacted to Greece’s impressive claim that the general government primary surplus for 2014 will be 3.918 billion euro. I don’t even bothered to dig deeper into Greek Finance Ministry claims and verify whether they were true or not. Greek media did it. And what I read today is a bunch of ironic comments. Look! I saw a primary surplus walking down there! BTW: General Secretary of Public Revenues announced today that the outstanding debt of the finance ministry to companies in the form of Value Added Tax returns: 806 million euro. Average waiting time for companies to receive the money is 417 days, i.e. more than one year. In January, the Finance Ministry announced the primary surplus for 2013 to be 691 million euro. Do not be mean and dare talk about “AHA-coincidence” and things like that. The primary surplus is not real money anyway. It’s on paper. Like the calculations of the Troika. It’s all on the paper and as such it should be handled. Any hard-hit eurozone crisis country could effectively and fast ameliorate its crisis by – while not leaving the euro – issuing a parallel emergency currency, preferably in electronic form, no bills and coins. It would enjoy confidence since the government would accept it as a share of tax payments. A government could spend – say – 30% in electronic currencies on top if its euro spending, and demand the same share back as taxes. Wages and prices could be adjusted to the same payment shares. One would get two stably functioning parallel monetary circuits. But this assumes that the current crop of politicians in the periphery countries care about their people & their countries. Unfortunately most of them are Merkel puppets. <- Here's a European who is skeptical of the Eurozone in it's current form. I am an internationalist and a supporter of the EU project in principle, but skeptical of the practical results under the current framework. I think most Europeans think this way, if asked the right questions. It's not that anyone is stupid or intelligent, it's just that the average person in a post-industrial society is incredibly uninformed when it comes to questions like this. People tend to focus on what's right in front of them – their everyday life – rather than on important big questions. 1. Federal union with ECB and the Brussels taking over fiscal responsibility. Moving forward as a union. 2. Quasi-federation with fiscal responsibility included in the ECBs mandate. Financed by the ECB, organized by the member states. 3. Dumping of the Euro and adopting national currencies again. Thus – I am a European who wishes to get rid of the Euro, unless the Euro elite gets some sense (which at this point seems a farfetched proposal).